Not much on the Moon escapes the eyes of NASA's Lunar Reconnaissance Orbiter, and China's Chang'e-3 lander and Yutu rover are no exception! The pair touched down on the lunar surface on Dec. 14, and just over a week later on Dec. 25 LRO acquired the image above, showing the lander and the 120-kg (265-lb) "Jade Rabbit" rover at their location near the Moon's Sinus Iridum region. The width of the narrow-angle camera image is 576 meters; north is up. 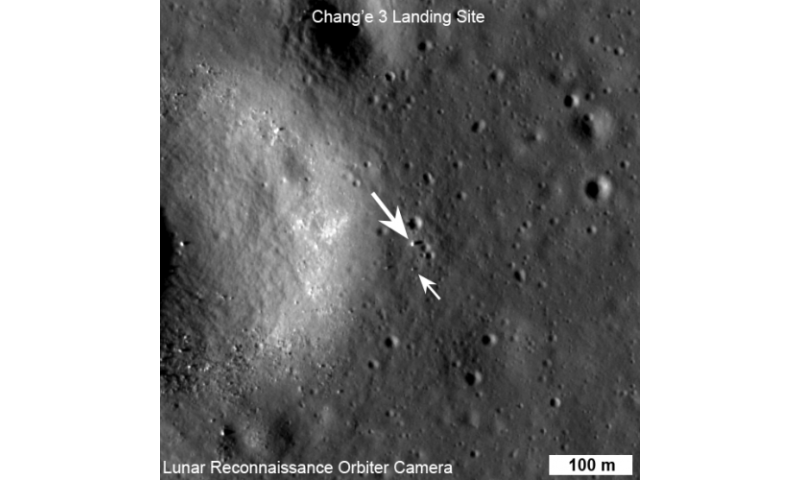 LRO was about 150 km (93 miles) from the Chang'e-3 site when the image was acquired. "The rover is only about 150 cm wide, yet it shows up in the NAC images for two reasons: the solar panels are very effective at reflecting light so the rover shows up as two bright pixels, and the Sun is setting thus the rover casts a distinct shadow (as does the lander). Since the rover is close to the size of a pixel, how can we be sure we are seeing the rover and not a comparably sized boulder? Fortuitously, the NAC acquired a "before" image of the landing site, with nearly identical lighting, on 30 June 2013. By comparing the before and after landing site images, the LROC team confirmed the position of the lander and rover, and derived accurate map coordinates for the lander (44.1214°N, 340.4884°E, -2640 meters elevation)." Both the Chang'e-3 lander and Yutu rover are reported to be in good health and performing well. The solar-powered rover went into sleep mode on Dec. 26 to wait out the 14-day lunar night, during which time the temperatures on the lunar surface can drop to -180ºC (-292ºF). Yutu's radioisotope heat source will keep it from freezing, but it won't be able to generate power from its solar arrays.